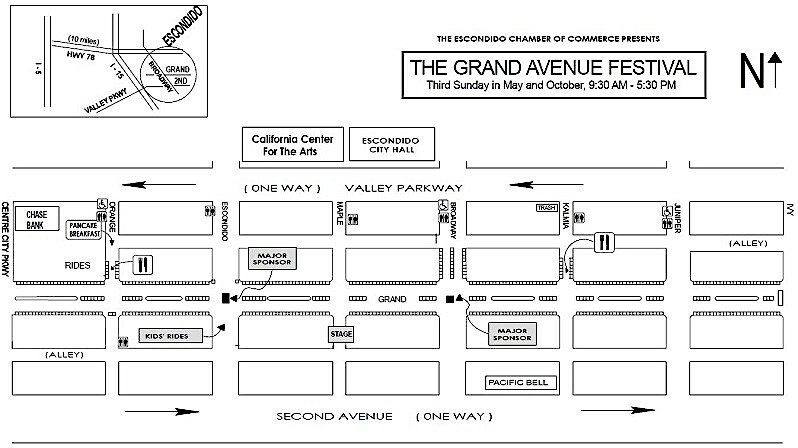 Escondido’s Grand Avenue Festival, aka Escondido Street Faire, that returns Sunday, May 15 might be only the second-largest single-day festival in California, but as they used to say in the old Avis rent-a-car commercials, they try harder. An estimated 30,000 to 40,000 people will flock to Grand Avenue and block after block of 500 vendors, food and music from 9 a.m. to 5 p.m..
Escondido’s first street faire was 1988. This year the festival once again with feeling spans downtown’s main street from Centre City Parkway to Ivy Street. Casey rides the festival circuit with his hats, sports uniforms and what-nots, so he ought to know. Monday it’s off to the Farmers Market at Welk Village for his many, and colorful, wares. Then, it’s Chino Hills for a church bash and later, a Chula Vista engagement. Next month, Casey, along with a lot of the other vendors, is off to the Carlsbad Street Faire, the largest single-day Festival in California. Both Carlsbad and Escondido’s festivals, along with the likes of the Vista Strawberry Festival and Fallbrook Avocado Festival — 14 North County San Diego festivals in all — are managed ably by Kennedy & Associates Street Faire Consultants. 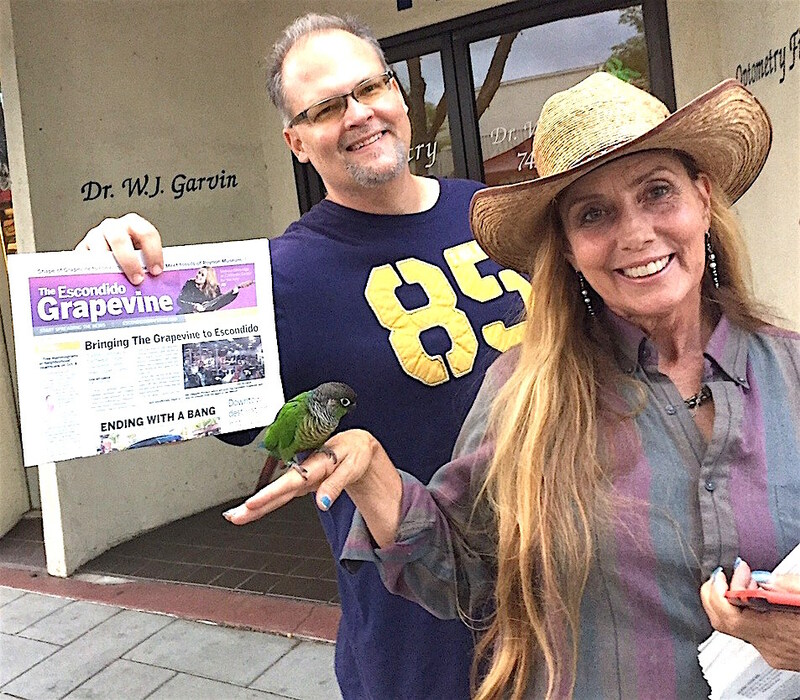 Chris Winkler and his 10-year-old parakeet, Chloe, with Shera Sandwell, and a copy of the street fair’s only newspaper last year. These days, Brian Roth, Kennedy’s son-in-law, heads the operation. 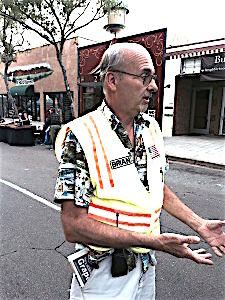 He was large and in charge last year with yellow vest and communication devices in tow as he supervised the grand fair at the corner of Grand Avenue and Broadway, ably assisted by Rick Bauer, Escondido site manager. “We had a great day today although attendance was a bit down due to uncertainty about the weather,” Roth said during the fall version of the fair(e). The Escondido faire — that’s correct, all Kennedy events feature the trademark “e” at the end of fair — is considered a great venue, according to Roth because it features lots of room for vendors to get in and out of the street. Set-up begins before dawn, around 5:30 a.m. The Escondido Chamber of Commerce and Downtown Business Association sponsor the event, as per usual. “This is a business but it’s fun,” Roth said, noting how his father-in-law faire founder focused on community and enjoyment rather than mere profits, although the business makes a little money, too, and who can quibble with that given the grand old experience. Those fun faire words were echoed last fall by vendors along with those many enthusiasts walking the street, block after block, with 500 booths of anything one could imagine this side of the San Diego County Fair. Devine said he enjoyed people watching while offering some off-the-cuff advice. “Happiness is not getting the newest or latest thing, but enjoying what you already have,” he said before demonstrating his well-worn flip phone to punctuate the point. Greg Dunn, another retiree from nearby Old Town Escondido, strolled along Grand Avenue’s double-yellow stripes, reveling in the freedom to walk on the street rather than dodge traffic crossing it. His dog Rocky accompanied him. Lay-out of the festival land. Meanwhile, Chris Winkler sauntered by with a group and his pet of a different color, and size, a 10-year-old parakeet named Chloe posing for photo opps just beyond James Stone’s many beautiful, handblown glass vases and objects. Stone has a studio and gallery along with partner Carol Rodgers featuring hot glass and mixed media at 1285 Simpson Way in industrial Escondido. One of Stone’s claims to fame is his employment of several people out of local rehab programs, giving “people who don’t fit in anyplace else” a chance to get back on their feet while helping bring out the best in glass and artistic, as well as utilitarian objects. Almost needless to say, an event of this size brings a highly eclectic and diverse group of vendors and folks out to the grand bazaar and road show. Martha Mendoza and Mario Morales was expected to feature Indian imported clothing under Elena’s Fashion banner. Sabrina Reid should be coming over from Camp Run-A-Mutt in San Marcos to let people know about its Halloween Spooktacular at 910 Armorlite Drive this fall. Dave and Aida Matheny will come on down from Fallbrook to cater the street with sausage from Matheny’s Wagon Works. Will you be there? Or be square? Carlsbad Art in the Village, August 14. Be the first to comment on "Kennedy & Associates back at it again with 2016 Grand Avenue Festival this Sunday"